Twitter is one of the most popular apps among Android users. Sometimes, you came across amazing photos and videos from tweets. And you are willing to download it on your phone for further usages. Fir users who are not familiar with Android OS, this is absolutely not an easy job. Hence, in here we have collected some useful tips, which you can use to download pics on your Android device as well as embedded videos in tweets. For static images/photos, you can simply download it with Twitter apps. There is no need to install third-party app in this case. First, launch your Twitter app and log in to your account. Then find or choose the picture that you want to save. Go to menu and tap "Save". The selected image should be stored on your Android phone. You can find twitter image folder in storage with file manager app. For animated GIFs in Tweets, you may have noticed that you cannot do it the way you are used to do on other websites, where simply by tap in the image and selecting Save photos. This option is not available in Twitter app. What do you need to do? It is best to use an app that allows saving GIF and Videos. In order to save bandwidth and make their servers run faster, Twitter converts all GIF animated files to MP4 video in default. This make GIFs makes load faster. The problem is that when you try to download them as if they were images, you cannot download them as video as you do not have the opportunity saving it as GIF format. Although there are applications in Google Play for doing this, which I'll discuss one at the end, you can do this directly, without the need to download anything, using an online converter of animated GIF of Twitter. Step 1: Open the application Twitter on your phone, then move to the animation that you want to download. Step 2: Press the animation expands to full screen, tap on menu and select "Share". Step 4: Launch the online converter from your browser, paste the copied URL in the online converter or animated Gif and press download. Once it was done, you will have the animated GIF of Twitter in your gallery photos on your Android phone and you can use it to share your social networks or any other application of Instant Messaging that allows the shipment of Animated GIFs. As already mentioned above, there is also the possibility to download one app from Google Play to do this. Its name is Tweet2gif let us see how to do this. Step 1: Download the application Tweet2gif from Play Store. 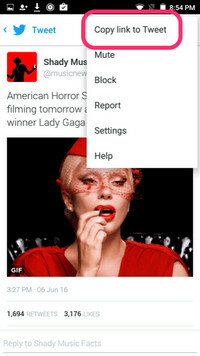 Step 2: As we did in the previous case, Open the application of Twitter and look for the animation you want to download. Step 3: Similarly, click on the animation or video and select Share. 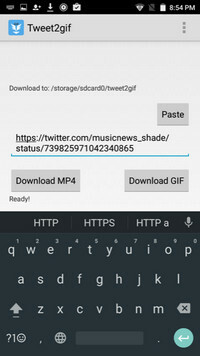 Step 4: This time, the menu Share, Select Tweet2gif option, with what is open the application concerned with the link to download already locked. Step 5: Once you have the application link Tweet2gif, you can download it in the format MP4, both being made of this article, in GIF format. To do this, press the button corresponding to your choice. In the end, with these options, you will be able to download pictures, GIF and Video from Twitter and have the opportunity to submit them who wants to, both inside and outside of this application.